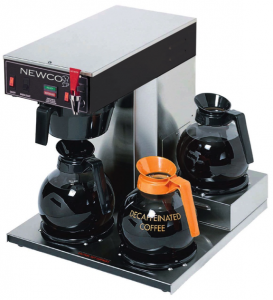 Our favorite brewer is the Ace Intelli-Brew series from Newco which combines the benefits of an environmentally sound brewer with the advanced brewing features of a gourmet coffee shop system. The IA is a smart, energy-conserving brewer that can power down when not in use – saving energy dollars. The IA series includes heater override, auto power save mode, tank protection and auto arm.